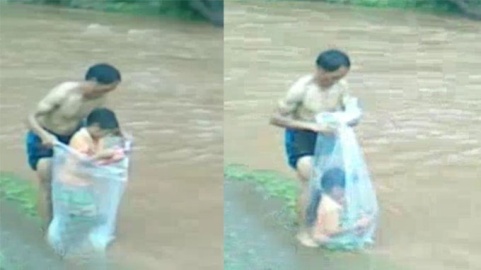 HA NOI (VNS)— The Minister of Transport Dinh La Thang has quickly responded to photos of children being hauled to school across a swollen river in plastic bags. The photos, which went "viral" in the media and on the internet, depicted a daily event in Sam Lang Village in Na Hy Commune in the northern mountain province of Dien Bien. There is already a solid stone and plank bridge across the river, the Nam Po, but it is regularly under water when it rains. The minister has now announced that a new, all-weather bridge worth VND3.5 billion (US$166,000), will be built across the river to prevent children risking their lives. Earlier this week, video clips showed teachers and students individually climbing into large bags and being pulled across the stream by a strong swimmer. The new bridge, which will be 80 metres long and 2.2 metres wide, is expected to be completed in two months. Director of the Dien Bien Department of Transport, Nguyen Dinh Giang, said that the province had more than 50 rivers which needed suspension bridges. He said this would cost about VND200 billion ($9.5 million). He added that more than 125 old suspension bridges were in a state of disrepair and needed repairing. However, the province could not start building them until it received extra funds. The province's total budget is VND600 billion ($28.5 million) per year. In another development, the Ministry of Education and Training has asked provinces and cities to prepare flexible study schedules and school hours to allow for local weather conditions. This means that schools in mountainous and remote areas can increase the duration of the Lunar New Year festival, give their students leave during floods and cold weather, and can shorten the summer vacation.